Deseeding melons has to be one of the best jobs for us. Why? Well, because you get lots and lots of melon to eat! now with the collection that we have here. First seen in 1948, this fantastic variety was bred for short summers - it swaps size for earliness - but without any sacrifice of sweetness or flavour. Compact vines grow about 4' and quickly set several small (cricketball-sized) melons with sweet orange flesh, edible right to the rind. The scent and flavour are incredible. Ripe melons can be located in the garden by smell alone! Fusarium-resistant, and the female flowers are formed even while it is young, thus outperforming many other varieties. Very, very early melon. It's going to be hard to improve on this one. This is an amzing, unique French heirloom from the early 1800s. 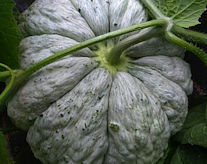 It is pumkin shaped, with a gently ribbed surface and beautiful marbled skin that starts green and ripens with an orange blush. It has been well maintained over the years and has an exquisite fragrance. It does not come off the vine when ripe, but you can tell when it's ready by the sweet scent, from a distance of several feet! Beautiful, multi-coloured melon, makes big fruit. A fab new variety from our 2018 trial - from Khasakstan, a remarkably early and productive vaiety, with dark green fruit. The unusual thing about this one is the crispness of pale green flesh - very sweet with an excellent flavour. Well adapted to short summers and cooler climates, this does well in the UK. 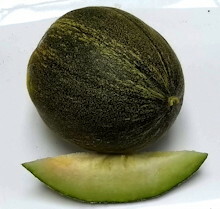 This is an heirloom early melon that was bred in 1905, which we have chosen for its excellent flavour when ripe. 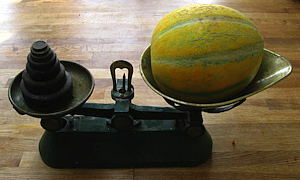 The melons are not too big (about 1 lb) so they ripen early, and are slightly ribbed with a netted skin. The succulent flesh is bright green and very juicy when ripe. Warning, sniffing the fruit may cause involuntary drooling. 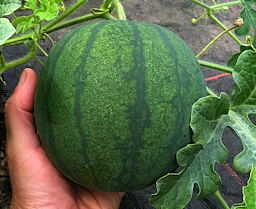 . .
A specially early, medium sized melon (about 1 to 2 lb) bred for home gardeners in shorter-season areas. The fruit are oval, with orange flesh, and a slight netting on the skin. This melon was bred by the late Professor Elwyn Meader who dedicated much of his life to breeding really tasty varieties for home gardeners in places with shorter or cooler summers, so many of his varieties do really well in the UK. We have several of his other creations (such as Sweet Chocolate Pepper) in our seedbank and they always rank highest in our taste trials. 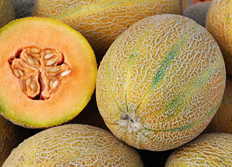 Medium melon for short seasons. An mini melon popular on island of Krim in the Black Sea . . .extremely sweet and fragrant. Typically they are about the size of a cricket ball; the flesh is creamy white and exceptionally juicy and refreshing. Early mini melons. Very aromatic & sweet - reminiscent of honeydew and cantaloupe. A new discovery for us, this traditional melon we recently got from Bulgaria was a real success in our 2013 trials. The plants were really happy and gew well in our polytunnel. 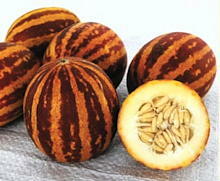 It is very early and sweet, and makes lots of larger slightly oval fruit, green with pale yellow stripes. They are indeed big enough to get 5 portions out of each one! 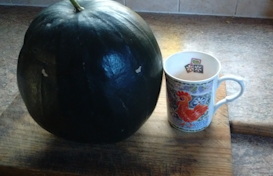 Larger early melon for short seasons, with a good flavour. Particularly good chilled in the fridge before serving.
" . . . and I think this is the best outdoors melon, together with De Belegarde. Not as early as Minnesota Midget but very tasty. Watch the watering though as they can split just before harvest. It is even better of course in a greenhouse - more productive. . ."
This view is shared by Amy Goldman (author of "Melons for the Passionate Grower"), who writes "this is the champagne of melons . ..you'll blink in disbelief when you taste its sweetness . . . it inspires devotion". 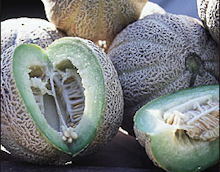 The melons are round, and smooth-skinned with slight ribbing, and very sweet, with a really good flavour and texture. Serve as it comes off the plant, or try it chilled with slivers of ham. Early melon with low heat requirement. Can try it outdoors in warm areas, but best in a greenhouse or polytunnel. Particularly good flavour. This incredible Ukrainian variety is really early with sweet flesh,a good flavour and nice crisp texture. Said to be grown in central Russia and even to ripen in Moscow - we can believe it. Most unusually, it keeps for several weeks after picking. Fantastic Ukrainian melon. Seed supply very limited, consider saving your own. If you've had no luck with watermelons in the past, here's your chance to try again with a better strain. This variety is very tolerant of cool weather conditions, and the best choice we have found for a UK crop. 'Blacktail Mountain' was developed by plant breeder Glenn Drowns of Iowa when he was a teenager in 1977, and time after time it beats all the other early watermelons in trials - it is widely acknowledged as one of the earliest varieties available. It has nice sweet red flesh, and is one of the the two we have found to grow in a polytunnel or greenhouse in the UK. 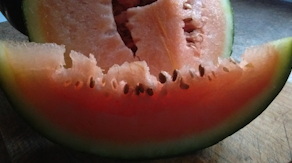 Sweet and tasty red fleshed fruit - look at that , watermelon grown in Wales! Yay! We're pleased to offer this early dark green watermelon with very sweet red flesh from our trial last year. Ben got the seed from Andrei Baranovski in the Ukraine , and it is adapted to northern lattitudes, doing well in our polytunnel here in Wales. Just a few packets from our trial plants for now. The fruit are particularly pretty with paler green stripes and good sweet flavour.